The mural that greets you when you step in the door is called “A Perfect Day.” The numerous amenities available at Baywatch in North Myrtle Beach, and unique features of this condo combine to create an atmosphere for guests to experience “A Perfect Stay.” A recent guest comment says it all, “Best One Bedroom Unit in all of Baywatch.” Enjoy the Ocean Drive Difference by starting your vacation immediately upon arrival, as this property comes with fresh bed linens/bath towels, the beds are already made up for you, and the departure maid service are all included in your price. The spacious open layout of this 635 square foot condominium includes many features normally found in larger two bedroom condos. Features include a roomy kitchen, washer/dryer, and balcony access from the living room or bedroom. The balcony is nearly three times larger than the balconies found in most oceanfront one bedroom condos, and offers a spectacular south-facing view of the coastline. 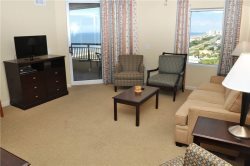 Relax and take in the panoramic views of the ocean and surrounding Grand Strand. The sunsets visible from this unit are spectacular and when you’re ready to call it a day, stretch out on the extra long double beds and go to sleep to the sound of the ocean. Baywatch Resort offers guests a variety of amenities. There is a game room, restaurant, and pool facilities located onsite. You're only a short drive away from the popular shops, attractions, and amusements that dot the main highway in North Myrtle Beach.